Marinated antipasto is always a welcome appetizer. But to be an applauded appetizer, serve them kabob-style on small wooden skewers. Combine cheese, artichokes and dressing. Refrigerate 30 min. to marinate. Drain cheese and artichokes; discard marinade. 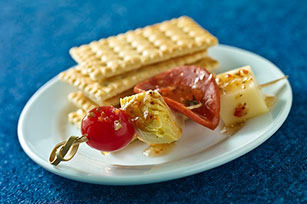 Thread 1 each tomato, artichoke quarter, pepperoni slice and cheese cube onto each of 16 small wooden skewers. Arrange on platter. Serve with crackers. Substitute 16 balls of POLLY-O Fresh Mozzarella for the cubed KRAFT Mozzarella Cheese. If fresh rosemary sprigs are available, substitute them for the wooden skewers. Wash and dry 16 (4- to 6-inch-long) rosemary sprigs. Remove leaves, leaving just a few leaves at the end of each sprig. (Reserve rosemary leaves for another use.) Thread ingredients on sprigs as directed. Substitute large pitted black olives or pimiento-stuffed green olives for the tomatoes.